Here at Memphis Boat Center, we love water sports just as much as you do. Every year new gear comes out from top companies such as Hyperlite, Slingshot, Byerly and HO Skis. These companies promise all new features and comfort behind the boat or at the cable park, but is it worth upgrading from your current set up? We usually have our guys demo the boards to get a feel for the riding style and rider ability that each board is intended for, so that we can better match our customers to their perfect set up. There has been a lot of change to the line ups this year, but here is our top 5 list of what we are most excited about for 2015 and what we think are the boards and tubes you should add to your arsenal this year! 1. Hyperlite Hi-Fi Surfboard: Noah Flegel’s signature model for 2015 looks as good as Noah does riding behind the boat. We have been waiting quite some time for Hyperlite to release a premier skim-style surfer to the wakesurf market. We believe they knocked it out of the park with this awesome board. Some of the features this board offers include: Dura-Shell Construction, 360 ABS Sidewall, Carbon Composite Construction, EPS core, Traction pad, and much more. This board is set to take you to the highest level in wakesurfing, so come on by and get your hands on one today. 2. Byerly Buck Wakeboard: Who Doesn’t love HUGE pop? A whole new shape for the Byerly line up in 2015, this board delivers explosive pop off the wake. The fiberglass rope construction creates twice the strength of a traditional wakeboard layup allowing this series to be thinner yet stronger. This board is going to be a board that will keep you smiling the whole time you are on it, but at the same time scaring you a bit with its enormous pop of the wake. 3. HO Sports Softshell Tube Technology: One of our biggest pet peeves while riding tubes was the rash that you would get from the rough sections of the tube. Thanks to HO’s Softshell Technology, those day are long gone! Softshell Technology covers 100% of the tubes for a soft feel that wont leave your skin irritated even if you ride all day. The revolutionary Softshell Technology makes HO tubes the best on the market! We suggest everyone gets theirs hands on one of these! 4. Slingshot Nomad Wakeboard: New for 2015, Slingshot announced a new product category that re-engages legacy participants in the sport of wakeboarding. The Nomad is being advertised as longboarding behind the boat. With its big sweet spot and increased surface area you can expect some of the following benefits: Increased stability, massive pop, softer landings, effortless water starts, and also the ability to cruise at lower speeds. The Nomad is the board that will make you feel young again and light the passion for wakeboarding that some may have lost over the years. Some side effects such as happy knees and stylish grabs were experienced by riders over the age of 25. 5. Slingshot Blue Pill Wakeboard: True to its name, this is Slingshots Stiffest board in it’s line up. Boat riders have been asking for a fast and aggressive board from Slingshot, and Slingshot delivered with the Blue Pill. The board has an aggressive 3-Stage Rocker that is ideal for riders that like to go huge off the wake, while carrying a lot of speed to take them out into the flats. Match this board with the new R.A.D boots and you will have one of the best looking set ups out there. Bonus. Hyperlite Baseline: This user friendly shape is easy to ride, forgiving, and fun. Shaun says it has “laughing pop” because when you pop off the wake you always find yourself laughing. This board will help riders build a better foundation and will also grow with riders as they progress their skills. Take it from the pros, this is the best board to have if you want to become a better rider. If you ever find yourself needing to secure something and don’t have a ratchet strap or bungie cord, these are the knots you need to know. Imagine you are trying to get your Christmas tree on the roof of your car and tie it down securely or have a cooler that you want to tie down to the swim platform of your boat, we think the easiest solution is the two knots that we are about to show you! You can use these two knots in many different situations whether you find yourself boating, camping, hiking, or even around the house and garage! Grab a rope, pay close attention, and follow along to learn 2 Knots that will serve you well to know! 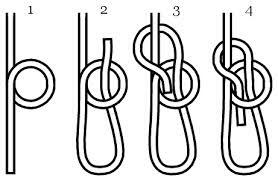 Practice several times during your down time so you don’t forget the knots and try securing different objects!